In the sporting world in April, the names of these fabled cities conjure up only one thing: the majestic marathon. And incredibly, their three 26.2-mile classics are run over a span of just eight days. They herald a highly-anticipated Spring Marathon Season, with races in Vienna, Hamburg, Düsseldorf, Hanover, Prague and many others following into May. The World Marathon Majors (WMM) races in London and Boston continue to grow in popularity but a number of other events, such as Vienna and Rotterdam, have also noted record entries. In terms of elite athletes, the fields continue to get more and more competitive. Just last January in Dubai, there were no fewer than five runners who went under the 2:05 barrier—something that had never happened before. 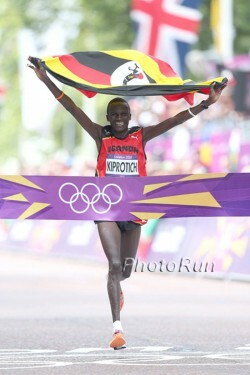 With times well under 2 hours and 20 minutes, 2012 was also an outstanding year for the women’s marathon. Britain’s Paula Radcliffe’s world record of 2:15:25, set ten years ago, continues to elude a new generation of runners. Among the men, in contrast, a number of athletes can be considered capable of improving the Kenyan Patrick Makau’s world record of 2:03:38 hours. When Boston celebrates its Patriots’ Day holiday, on April 15 six runners with personal best times of under 2:06 will be on the starting line: the Ethiopian pair of Gebre Gebremariam (2:04:53) and Markos Geneti (2:04:54); Levy Matebo (Kenya/2:05:16); Shami Abdullah Dawit (Ethiopia/2:05:42); Dickson Chumba (Kenya/2:05:46); and the 2010 Boston Marathon victor Robert Kiprono Cheruiyot (Kenya/2:05:52). Among their rivals will be the defending champion Wesley Korir. Injury has unfortunately sidelined Americans Ryan Hall and Meb Keflezighi as well as Kenya’s Moses Mosop this year. Moses would have been the fastest competitor with his time of 2:03:06, set in Boston in 2011. The women’s field is equally impressive. The Ethiopians Aselefech Mergia (2:19:31) and Meseret Hailu (2:21:09), the current World Half-Marathon champion, are the fastest participants. 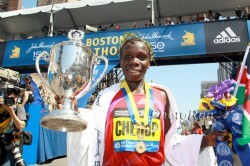 Among their opponents is the defending champion, Sharon Cherop of Kenya. After a gap of eleven years, some are predicting that the women’s course record of 2:20:43 could be improved this year—or even that we might see a time under 2:20. Eleven women in the field have achieved personal bests of under 2 hours and 26 minutes. The Virgin London Marathon on April 21 also promises thrills. World-record holder Patrick Makau (Kenya/2:03:38) as well as the Olympic champion Stephen Kiprotich (Uganda) and the fastest runner of all time, Geoffrey Mutai (Kenya/2:03:02) will be battling each other. 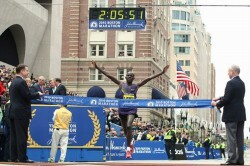 (Geoffrey Mutai achieved his result in Boston, where the course does not meet world record requirements.) In addition, last year’s winner, Wilson Kipsang (Kenya/2:03:42), officially the second-fastest runner in history, and Ethiopian star Ayele Abshero (2:04:23) are also in the mix. This means that seven runners who have times under 2:05 will be on the starting line. Mo Farah, Britain’s double-Olympic champion in the 5,000m and 10,000m, plans to join the men’s elite for the first half of the race. The women’s line-up in the British capital is equally competitive. Olympic champion Tiki Gelana (Ethiopia/2:18:58), and the Kenyan duo of Florence Kiplagat (2:19:44) and Edna Kiplagat (2:19:50) are the leading runners. Sadly, a leg injury has postponed the eagerly-anticipated debut of the 10,000m Olympic champion Tirunesh Dibaba. Also absent will be last year’s winner: Mary Keitany of Kenya is expecting her second child. Also pregnant and missing the race is the double-London winner, Liliya Shobukhova from Russia. Can Geoffrey Kipsang Come Out on Top in Rotterdam? The ABN AMRO Rotterdam Marathon has consistently produced world-class results in recent years, and this year the men’s field has drawn particular attention from running fans. 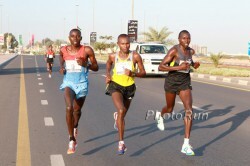 Geoffrey Kipsang (Kenya) will be among the favorites on April 14. The 2011 World Junior Cross-Country champion finished third in 2:06:12 in his marathon debut last year and in February, he won the Ras Al Khaimah Half Marathon (United Arab Emirates) in a fast 58:54 against strong opposition. 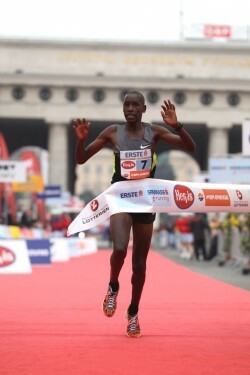 The Vienna Marathon will also be held on April 14, when last year’s winner, Henry Sugut (Kenya), who ran an Austrian all-comer’s record of 2:06:58, takes on a field that includes his fellow countrymen Jafred Kipchumba (2:05:48) and Gilbert Yegon (2:06:18). In the women’s race, the Ethiopian marathoners Kebebush Haile (2:24:09) and Meskerem Assefa (2:25:17) are the fastest—though Kenya’s Flomena Cheyech Daniel might spring a surprise. Her best time is only 2:34:13, but she won the Rome-Ostia Half Marathon in February in an impressive 67:39. Ethiopian superstar Haile Gebrselassie will be making his third consecutive appearance in the day’s half marathon. Anticipation is high for this competition which will take place four days before Haile’s 40th birthday. The Prague Marathon has developed greatly in recent years and looks to have a strong field for the race on May 12. Among the women will be Kenya’s Philes Ongori. After finishing second in the Berlin Half Marathon last Sunday (68:01) she hinted that she wants to run 2:20 in Prague. Men: Berhanu Shiferaw (ETH/2:04:48), Getu Feleke (ETH/2:04:50), Bazu Worku (ETH/2:05:25), Tilahun Regassa (ETH/2:05:27), Wilson Chebet (KEN/2:05:27), Sammy Kitwara (KEN/2:05:54), Geoffrey Kipsang (KEN/2:06:12), Assefa Bentayehu (ETH/2:06:22), Atsedu Tsegay (ETH/Debut), John Mwangangi (KEN/Debut). Women: Hilda Kibet (KEN/2:24:27), Misikir Mekonnin (ETH/2:25:21), Harun Makda (ETH/2:26:46), Alessandra Aguilar (ESP/2:27:00), Abebech Afework (ETH/2:27:08), Mekuria Aberume (ETH/2:27:20), Miranda Boonstra (NED/2:27:32), Jemima Jelagat (KEN/2:28:32), Adriana Nelson (USA/2:28:52). Men: Jafred Kipchumba (KEN/2:05:48), Gilbert Yegon (KEN/2:06:18), Henry Sugut (KEN/2:06:58), Peter Kamais (KEN/2:07:37), Solomon Kiptoo (KEN/2:08:30), Geoffrey Ndungu (KEN/2:08:35), Aleksey Sokolov (RUS/2:09:07), Ishmael Bushendich (KEN/2:09:09), Oleksandr Sitkovskyy (UKR/2:09:26). Women: Kebebush Haile (ETH/2:24:09), Meskerem Assefa (ETH/2:25:17), Rosaria Console (ITA/2:26:10), Emily Samoei (KEN/2:26:52), Olha Kalenarova-Ochal (POL/2:31:33), Flomena Cheyech Daniel (KEN/2:34:13). Men: Gebre Gebremariam (ETH/2:04:53), Markos Geneti (ETH/2:04:54), Levy Matebo (KEN/2:05:16), Shami Abdullah Dawit (ETH/2:05:42), Dickson Chumba (KEN/2:05:46), Robert Kiprono Cheruiyot (KEN/2:05:52), Wesley Korir (KEN/2:06:15), Raji Assefa (ETH/2:06:24), Abdi Abdirahman (USA/2:08:56), Micah Kogo (KEN/Debut), Lucas Rotich (KEN/Debut). Women: Aselefech Mergia (ETH/2:19:31), Meseret Hailu (ETH/2:21:09), Mamitu Daska (ETH/2:21:59), Rita Jeptoo (KEN/2:22:04), Sharon Cherop (KEN/2:22:39), Madai Pérez (MEX/2:22:59), Alemita Abera (ETH/2:23:14), Tetiana Gamera-Shmyrko (UKR/2:24:32), Kara Goucher (USA/2:24:52), Shalane Flanagan (USA/2:25:38), Ana Dulce Félix (POR/2:25:40), Yolanda Caballero (COL/2:26:17), Sabrina Mockenhaupt (LG Sieg/2:26:21), Diana Sigei (KEN/2:26:53), Karolina Jarzynska (POL/2:27:16), Serena Burla (USA/2:28:27). Men: Geoffrey Mutai (KEN/2:03:02), Patrick Makau (KEN/2:03:38), Wilson Kipsang (KEN/2:03:42), Ayele Abshero (ETH/2:04:23), Tsegaye Kebede (ETH/2:04:38), Emmanuel Mutai (KEN/2:04:40), Feyisa Lilesa (ETH/2:04:52), Stanley Biwott (KEN/2:05:12), Martin Lel (KEN/2:05:15), Deressa Chimsa (ETH/2:05:42), Marilson Gomes dos Santos (BRA/2:06:34), Stephen Kiprotich (UGA/2:07:20), Yared Asmeron (ERI/2:07:27), Adil Annani (MOR/2:07:43). Women: Tiki Gelana (ETH/2:18:58), Lucy Kabuu (KEN/2:19:34), Florence Kiplagat (KEN/2:19:44), Edna Kiplagat (KEN/2:19:50), Priscah Jeptoo (KEN/2:20:14), Meselech Melkamu (ETH/2:21:01), Atsede Baysa (ETH/2:22:03), Yukiko Akaba (JPN/2:24:09), Remi Nakazato (JPN/2:24:28), Jessica Augusto (POR/2:24:33), Alevtina Biktimirova (RUS/2:25:12), Mai Ito (JPN/2:25:26), Nadia Ejjafini (ITA/2:26:15), Renne Baillie (USA/2:27:17), Olga Dubovskaya (BLR/2:28:08), Adriana Da Silva (BRA/2:29:17), Freya Ross (GBR/2:28:10), Joyce Chepkirui (KEN/Debut). Men: Chala Dechasa (ETH/2:06:33), Joseph Gitau (ETH/2:06:58), Lawrence Kimaiyo (KEN/2:07:01), Limenih Getachew (ETH/2:07:39), Daniel Abera (ETH/2:08:52), Wilson Kiprop (KEN/2:09:09), Henry Chirchir (KEN/2:09:24), Dimitry Safronov (RUS/2:09:35), Jacob Cheshari (KEN/2:09:43), Tobias Sauter (GER/2:17:27), Eliud Kipchoge (KEN/Debut). Women: Kateryna Stetsenko (UKR/2:27:51), Diana Lobacevske (LIT/2:28:03), Malika Asahssak (MOR/2:30:23), Caroline Chepkwony (KEN/2:30:34), Magdaline Mukunzi (KEN/2:30:46), Iuliia Arkhipova (KGZ/2:30:57), Almaz Alemu (ETH/2:31:27), Lisa Hahner (Run2Sky.com/2:31:28), Mona Stockhecke (GER/2:38:21), Katharina Heinig (GER/2:39:03). Men: Duncan Kibet (KEN/2:04:27), Duncan Koech (KEN/2:07:53), Pius Ondoro (KEN/2:08:00), Cosmas Kigen (KEN/2:09:43), Raymond Bett (KEN/2:11:32), Luis Feiteira (POR/2:11:57), André Pollmächer GER/2:13:09), Marian Blazinski (GER/2:15:34), Milton Rotich (KEN/Debut). Women: Melkam Gizaw (ETH/2:26:52), Nastassia Dashkevich (BLR/2:34:08), Agnieszka Ciolek-Mierzejewska (POL/2:34:15), Remalda Kergyte (LTU/2:35:20), Veronica Pohl (GER/2:34:59), Rebecca Chesire (KEN/Debut). Men: Wilfred Kigen (KEN/2:07:33), David Kisang (KEN/2:08:54), Lusapho April (RSA/2:09:25), Joseph Kiptum (KEN/2:09:56), Wesley Langat (KEN/2:10:40). Women: Olena Bukovska (UKR/2:28:31), Natalya Sokolova (RUS/2:30:10), Marta Lema Megra (ETH/2:31:01), Mercy Kibarus (KEN/2:44:56), Edinah Kwambai (KEN/Debut). 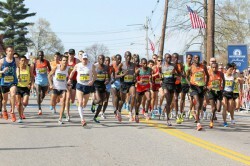 * The course of the Boston Marathon does not meet the conditions required to be granted world-record status. share equally prize money of one million US-dollars.